This week, I am in a drab little town called The Woodlands* in Houston, Texas, for the 44th Lunar and Planetary Science Conference (LPSC). The LPSC is the kind of international mega-conference that fills the ballrooms of a large convention centre and swamps a dozen local hotels with delegates. Some of it is being streamed online. There are scientists here from all over the world including many from NASA – fewer than last year because of federal budget cuts! 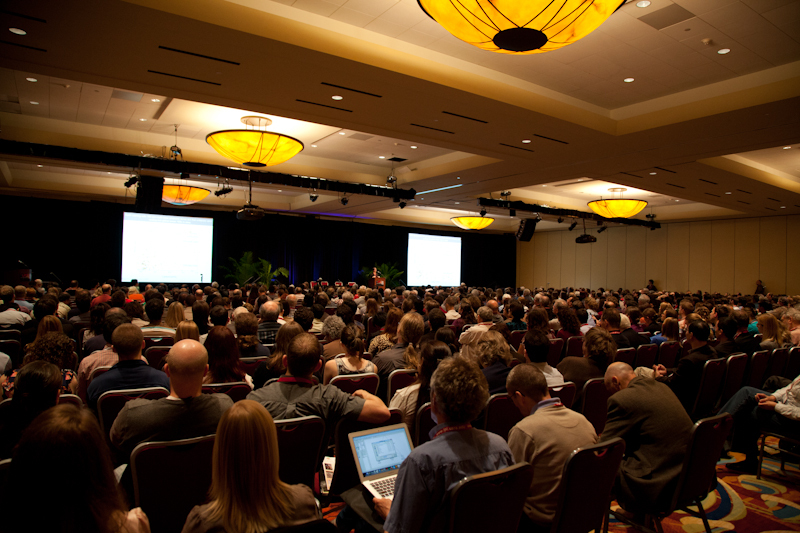 The several hundred conference presentations have been assembled into about fifty sessions over five days, each covering a broad topic like “planetary atmospheres”, “fluids on Mars” or “early solar system chronology”. There are always three or four sessions running in parallel, so there’s no way to see everything. I’ve mostly attended the Mars sessions because of their relevance to my own work; four have reported recent results from NASA’s Mars Science Laboratory. But I’ve also dropped in on fascinating talks about the strange volatile-escape pits on Mercury and hydrocarbon rain on Saturn’s moon, Titan. Today, I particularly enjoyed a talk about the dark streaks that appear seasonally on certain Martian hillsides (image here). The speaker reported that these only form where temperatures exceed the freezing point of pure water. This means they are probably created by fresh water melting out of ground ice, and not sediment or brine as had previously been thought (a sophisticated computer model backs up the new interpretation). This might be good news for the habitability of Mars: it would be disappointing if the aquifers there turned out to be too salty. But my favourite presentation of the conference so far was Lindy Elkins-Tanton’s special lecture on Monday about the origin of the Earth’s water. As an undergraduate, I was taught that the oceans were delivered at a late stage by comets, but Elkins-Tanton demonstrated that the ordinary rocky material that built our planet already contained enough water for the job. She also showed that, even though the early Earth was extremely hot and probably clothed in a seething ocean of molten rock, it wouldn’t have lost its primordial water by evaporation. Her results suggest that watery, Earth-like planets might be common in the universe, without the need for special cometary intervention. Aside from their academic value, conferences are always good opportunities to observe “aspects of scientific life and manners”. I was impressed today by the response of a well-known planetary scientist to a presentation that strongly criticised his work, naming him as the author of a series of errors and oversights. When the talk ended, the scientist in question stood up and shook the speaker warmly by the hand before giving his own divergent take on the subject, without any sign of indignation. This display reminded me of an anecdote told by Richard Dawkins (second paragraph in this link). My own contribution to this conference is a pair of posters to be exhibited tomorrow evening (with about 700 others), when I shall have to defend them from marauding (usually friendly and constructive, actually) critics. Wish me luck! * As far as I can make out, The Woodlands is just a vast concrete plain encrusted with fast-food restaurants and billboards, which advertise mostly either car parts or spiritual salvation. In the middle of this urban wasteland is a Milton-Keynesian tableau of soulless artificial landscaping and glass-fronted offices and hotels. One of these, an enormous Marriott, doubles as an exhibition space and convention centre. This is our venue. Have a great time bro! I hope the marauding critics don’t bother you too much, and that you don’t spend too much time in the bar. And watch out for those volatile-escape pits! Haha. Trust you to notice the comic potential of the phrase “volatile-escape pits”.